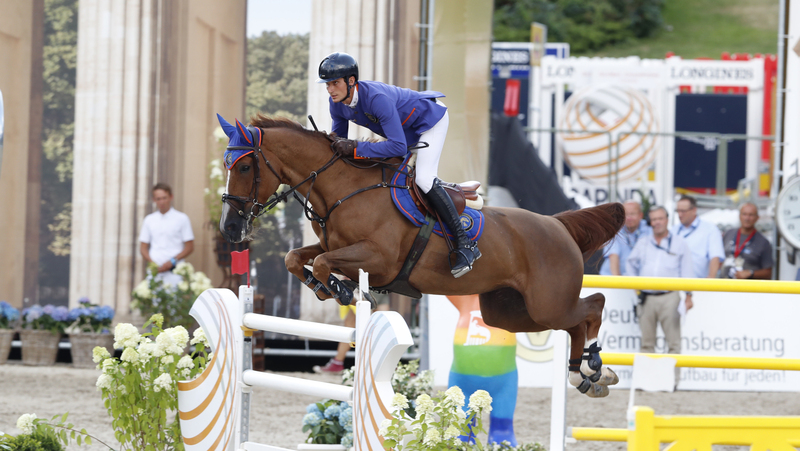 The GCL Berlin final looks set to be a tantalising battle of the best, with four teams heading into today’s competition on a zero score, and one team on just one time fault. Current leaders Valkenswaard United have kept the same line up of Marcus Ehning and Alberto Zorzi, however have swapped Ehning’s Cornado NRW with the small but feisty stallion Comme il Faut. At the sharp end of the grid there have been no rider changes, however St Tropez Pirates will field Edwina Tops-Alexander and Pieter Devos who makes a horse change from Apart to Claire Z. Ludger Beerbaum and Christian Kukuk of the home city team Berlin Eagles keep top horses Cordess and Casello for this round of action, as will Rome Gladiators’ Lorenzo de Luca and Constant Van Paesschen who ride Jeunesse van T Paradijs and Jilbert van’T Ruytershof. Elsewhere in the field, the Prague Lions will bring in Niels Bruynseels alongside Peder Fredricson, and Sameh El Dahan will take over the reins for the Hamburg Giants alongside Christian Rhomberg. Overall ranking leaders London Knights make no changes to their horse and rider line up, with Olivier Philippaerts and Martin Fuchs competing today on H&M Legend of Love and Clooney. The action kicks off at 11:30 local time, with every second streamed live on GC TV and via FB LIVE on the official page. Click here for the startlist.